We’re once again proud to participate in this year's Move America Forward Troopathon, an annual online fund raiser for our troops serving overseas. These brave men and women are putting their lives on the line daily to preserve our freedoms, in spite of the lack of support from many politicians in Washington. Many people may not realize that our troops are basically supplied with only a gun and a uniform (even certain parts of the uniform must be purchased). Anything else must come from the home folks. Liberal politicians can spend billions on bailouts for banks, GM and others, or to provide sweet deals for the union bosses, but won't cover the basics for our troops. We even had to send money to buy our son’s body armor before he left. He is current serving with his marine unit in the vicinity of Kandahar in Afghanistan. 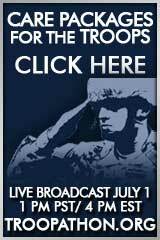 This year’s Troopathon will be held on June 1 from 4pm to midnight eastern time. In it’s first two years, the event has raised over $2 Million and sent over 168 tons of care packages to Iraq and Afghanistan, all to support our troops. Most of the liberal (so-called) mainstream media outlets are ignoring the event, however Fox News has run several features. Sponsors and participants include Melanie Morgan (President of Move America Forward), Sean Hannity, Laura Ingraham, Dennis Miller, Mark Levin, John Bolton, former Nebraska football coach Tom Osborne and many others. You can help make the daily routine of our troops serving in Afghanistan and Iraq a little more bearable and thank them for their services all at the same time. We've heard from countless members of the Armed Forces serving in the Middle East about items that the military does not provide, are hard to come by and they really appreciate getting. That's why Move America Forward has responded and compiled care packages that contain these goods as a way of saying "thank you" for their sacrifices and courage. Care packages are packed full of gourmet coffee, Oreo cookies, Jelly Belly jelly beans, high-quality beef jerky, trial mix, Gatorade, deodorant, Chap Stick, sun block, CDs and much more. All care package donations are tax deductible and start at $24.99. If this is too much for one person, please consider taking up a collection from your co-workers, friends, neighbors, church group etc for this worthy cause. Thank you very much for your support and praying daily for our brave troops. Here’s a story from just a few miles up the road. Capt Michael Clauer of Frisco, Texas had been serving his country on dangerous missions in Iraq, and was responsible for the lives of over 100 soldiers. Yet, Capt Clauer returned home to find that the Heritage Lakes Homeowners Association had foreclosed and sold his $300,00 home over a debt of $977.55. Michael and his wife May had owned the house free and clear, but his HOA sold it at auction for $3,201 to Mark DiSanti of Dallas and Steeplechase Productions, who flipped the house to Jad Aboul-Jibin of Plano for $135,000. The HOA had sent notices by certified mail demanding payment, but May was suffering from depression over her husband's absence, and she let mail pile up and didn't open any of the certified letters. She only found about the sale when the new owner demanded rent. The Clauers are now in a lawsuit to get their house back. Their attorney argues that her clients are protected from foreclosure by the Servicemembers Civil Relief Act. The federal law protects those on active duty from certain financial and legal obligations, including foreclosure, without a court proceeding. The attorney notes "This is so outrageous. There's a strong opposition to the power that HOAs are granted in Texas that goes beyond Capt. Clauer and his military status." The Clauers have been allowed to continue living in the house under a judge's order. And this week, a federal district judge ordered all the parties involved to get together to try to reach a settlement on the question of ownership. Trey Branham of Goldfarb Branham LLP in Dallas said if the suit's allegations are true, the HOA may have a significant legal problem. "There's some law in Texas that says property is unique and if you take it wrongfully, you're obligated to get it back," said Branham, who has represented both HOAs and homeowners on various legal matters. Other options, he said, could include buying the couple another house or paying them what the house was worth. "But none of them is inexpensive," he said. WFAA-TV originally broke the story on May 14, and the DMN has an update this morning. UPDATE (Aug 4, 2010): Ownership of Home Returned to the Clauers. General Stanley McCrystal, America’s top commander in Afghanistan, came under fire today for interviews given to Rolling Stone magazine. In the interview, some of Gen McCrystal's aides questioned the competency of President Obama and other members of his administration for their handling of the war. There’s already preliminary reports this evening that the general has tended his resignation. Mr Obama’s only comments so far are that the general used very poor judgment and he would not make a decision before speaking with the general. Now, all of the comments from the interview that I’ve read so far appear to be true, but perhaps he could have picked a better venue than the ultra-liberal anti-troop magazine to deliver them. Mr Obama campaigned on the platform that Iraq was the bad war, but Afghanistan was the real war. He then spent several months reviewing his strategy while the troops waited. He claimed that he was involved daily, but only brought the general to the White House for a 10-minute photo-op after four months. This eerily reminds us of his performance with the gulf oil spill, claiming he was involved from day one, then finally inviting the head of BP for a 20-minute photo-op two months later before heading once again to the golf course. So, the question is, should Mr Obama accept this resignation or fire the general. This could prove to be a dilemma for Mr Obama since the answer is not so clear as it first appears. First, Gen McCrystal voted for Mr Obama (another case of poor judgment), and Mr Obama hand-picked Gen McCrystal before taking the very unusual step of relieving his predecessor in the middle of the Afghan campaign, a move defense officials at the time compared to President Harry Truman's firing of Gen Douglas MacArthur during the Korean War. This fact will make it more difficult for Mr Obama to execute his usual BEOB (blame everything on Bush) strategy regarding this incident. Next Gen McCrystal is very popular with Afghan President Karzai and many other allies. In addition, relieving the general would certainly delay the rush to Kandahar, made necessary by Mr Obama’s artificial deadline for withdrawal that he has promised to his far-left base. Finally, the dismissal of the general would not solve any of the internal problems among Mr Obama's team that was mentioned in the interview, but only continue to cover them up. Gen McCrystal's motive for the interview remains unclear. He was undoubtedly frustrated with being forced to fight with one hand tied behind his back, but was he a loose cannon, or did he voluntarily "fall on his sword", possibly sacrificing his job for the benefit of his troops? Tomorrow should prove very interesting indeed. As always, we remind our readers to continue to pray for our troops. I often speak with other marine parents, and there is much visible frustration among our troops due to lack of a clear strategy. Yet, these brave men and women continue to do their jobs in order to protect our freedoms. Baldilocks just posted a very powerful and inspirational must-read article on her blog. We’re proud to feature it here and share in her hope “that a young lady reading this will take it to heart and turn away from a faulty life”. I’m 48 and I’ve been pregnant twice but I have no children for two reasons: immorality and morality. My first pregnancy occurred when I was 17 and not married. I had an abortion because it was convenient–I had no spiritual beliefs at the time. My second pregnancy occurred 13 years later when I was married. It was planned and conception happened after the nuptials were said, but I miscarried–it was an ectopic pregnancy and it happened because, before I married, I continued to fornicate and contracted chlamydia, a venereal disease which is easily cured but which scars the fallopian tubes and can prevent the fertilized egg from traveling to the uterus where it needs to implant and grow. In an ectopic pregnancy, the fertilized egg implants in the fallopian tube–a place too small for a growing human. If an ectopic pregnancy is allowed to advance past 1 month, it will kill the mother and, obviously, the baby. I still mourn both of my children. Afterward, however, I decided to do things God’s way–the God of the Bible–even if it meant that I would never have children. (My ex asked me for a divorce right after I miscarried and I have never remarried.) There are always miracles. My point is that if I had conducted my relationship and reproductive lives differently, I’d have children. However, I am content to carry on my life as is and to accept God’s grace. Faith, forethought and behavior are the keys. Some of you [commenters] may not agree with my premises, but, perhaps a young lady or two reading this will take my words as a cautionary tale. We thank this great lady for her courage in posting this, and pray God will use it to encourage and guide other women who may be facing similar situations and decisions. May God continue to bless her ministry. I received this story from Dr Kim Hall (via Tammy) over at Hunters Glen Baptist Church. It was written by a person who recently attended the Dallas Christian Leadership Prayer Breakfast, an annual event started by Tom Landry and others over 40 years ago. 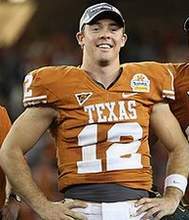 This year’s speaker was Brad McCoy, the father of former University of Texas quarterback Colt McCoy and two other sons. Colt was also scheduled to speak, but had to withdraw due to an illness. Kim pointed out that this speech was especially relevant during this time of year as many prepare for their children’s graduations. 1. "Prepare your child for the path, not the path for your child." Brad said this is not just for our kids - it is for us as parents. The road is rough, narrow and hard to find. We have a book (the Bible), a map vis-à-vis the Bible and God to help us. We must prepare ourselves and our kids for moments in life when doors open and close. He cited Proverbs 22:6: "Train a child in the way he should go, and when he is old he will not turn from it." He also cited, almost in jest but also in reality, Proverbs 23:13, "Do not withhold discipline from a child; if you punish him with the rod, he will not die." It was a funny contrast, but a real contrast. He then said, "Dads, fight for your kids, prepare them!" 2. "Prepare to be our best." This was one of the four McCoy family mottos. He cited 1 Corinthians 9:24, "Do you not know that in a race all the runners run, but only one gets the prize? Run in such a way as to get the prize." He stated that every day he would take his kids to school and upon them exited the car, he would say to them, "Do your best and be a leader!" He said that they listened every time and even as they got older (4th, 5th and 6th grades) he would repeat these words even if they said, "Yeah, Yeah, Dad, I know, do your best and be a leader!" He said that as a coach for 27 years, he would always lead his team onto the field and leave his team at every practice with the chant, "Expect to Win, Play to Win." And he implored us as parents to instill the same attitude in our homes and in our children. He cited Jim Collins book, "Good to Great", stating that good is the enemy of Great! We don't aim high and miss - as we would like to believe. In fact, most times, we aim low and hit the mark! As parents, he implored us not to aim low! Aim high!!! 3. "Be a Leader." He stated that we are surrounded by such a great cloud of witnesses - great leaders that we can draw from and that our kids can draw from. He said we are all at the mercy of time and money and asked a rhetorical question: How do you spend your time and money. He then said that how we spend our time and money is a direct reflection on where our true priorities lie. Convicting! He then said as a leader that he has always loved the quote by Ghandi (even though he didn't ascribe to all of Ghandi's beliefs): "I will not let anyone walk through my mind with dirty feet." He said that as he taught this principle to his three boys that Colt McCoy turned this phrase into his own words: "Thoughts become things." Colt would tell his younger brothers as he mentored them, "You can't talk like that or think like that, because thoughts become things that play themselves out in your life." 4. "Prepare for Open and Closed Doors." As a Dad, he said it was painful beyond all of his years on this earth to watch his son get hurt in the first series of play in the National Championship at the Rose Bowl. A perfect setting. A setting his son had dreamed of ever since he threw the football with his Dad in the front yard as a kid. As a Dad, he went over to his son's hotel room after the Championship loss and the demoralizing fate for such a NCAA football star. He went to his son's room to cheer his son up and was praying to God for the right words. He entered his son's hotel room to find his son finishing a devotional. The devotional read as follows: "My positive energy must be better than my negative energy. My certainty must be stronger than my doubt. The battle is won before I ever start the fight. I choose faith over fear. Leave a legacy of excellence, love, dedication and service. Jeremiah stated, 'Blessed is the man whose trust is in the Lord.' He said he had to find a corner of Colt's hotel room to sit down and cry over the maturity of his son. His son was prepared for open and closed doors! Wow!! He then finished his speech by stating that as he consoled his son under the Rose Bowl stadium (after it was readily apparent that Colt would not be able to go back onto the field and play for the Longhorns), as he was trying to motivate his son, his son motivated the team and his Dad. His son stepped into a new mantle of leadership. Rather than return to the field in pedestrian clothes, Colt insisted on returning to the field to help his team win. He walked back onto the field in his uniform and helped the second string quarterback read the defense and mentored the second string quarterback over the course of the 3rd and 4th quarters. He said that his son had been studying "trust" in a Bible Study all year long leading up to the National Championship game. He said his son had told his mom and dad that he didn't know why he had been studying that "trust" concept all year, but he fully knew why in the moments leading up to the National Championship loss. He told his parents that he came to the conclusion that God had "prepared me for years leading up to that game, because He wanted me to "trust" Him!" When Colt was approached by news reporters after the Longhorns had lost the National Championship, the reporters asked Colt how he was feeling and Colt replied: "I always give God the glory. I never question what God does. God is in control of my life and if nothing else, I am standing on the Rock!" Brad McCoy said that his cell phone began lighting up with texts after the game with friends, ministers and family members wildly acclaiming the statement that Colt had made to the reporters. He said that he received letters from non-believers, Jewish ministers, Muslim ministers and atheists in the days following the game - all pointing to the AMAZING statement that Colt had made after the game. He said that as he entered Colt's hotel room that night, he asked his son, "What did you say after game?" [He had not been able to hear it in the mayhem of the stadium.] Brad McCoy, Colt's Dad, asked two to three times, "Son, what did you say after the game?" Colt said, "Dad, I don't know. I really don't remember what I said. All I remember is that the reporter asked me a question and I prayed that God would supply me with the right answer." Wow!! My hope is built on nothing less, Than Jesus' blood and righteousness. I dare not trust the sweetest frame, But wholly trust in Jesus' Name. On Christ the solid Rock I stand, all other ground is sinking sand; all other ground is sinking sand. When darkness seems to hide His face, I rest on His unchanging grace. In every high and stormy gale, My anchor holds within the veil. On Christ the solid Rock I stand, All other ground is sinking sand; All other ground is sinking sand. His oath, His covenant, His blood, Support me in the whelming flood. When all around my soul gives way, He then is all my Hope and Stay. On Christ the solid Rock I stand, All other ground is sinking sand; All other ground is sinking sand. When He shall come with trumpet sound, Oh may I then in Him be found. Dressed in His righteousness alone, Faultless to stand before the throne. On Christ the solid Rock I stand, All other ground is sinking sand; All other ground is sinking sand. By the end of his singing, the entire room of men and women were singing in unison with Brad McCoy. It was truly an amazing morning for the Lord and a truly amazing speech for us to learn from as parents and Grandparents.